Alfred A. Knopf, 9780375835322, 40pp. 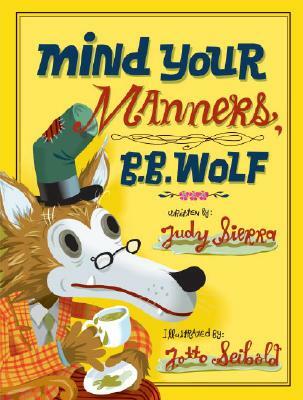 BIG BAD WOLF, now old and residing in the Villain Villa Senior Center, is invited to a tea by a children's librarian. His best friend, a toothsome crocodile, warns him that he will have to mind his manners. B. B. Wolf makes up a song: -Sip your tea and never slurp, say 'excuse me' if you burp. Smile and have a lot of fun, but don't go biting anyone.- He remembers to say -please- and -thank you- and he gives a nervous Red Ridinghood, Three Little Pigs, and Gingerbread Boy his biggest smile ever, but when his stomach starts to gurgle, he gets a little mixed-up about what to do when you burp. This hilarious read-aloud story is a gentle reminder for children still learning their manners. Judy Sierra is the author of Wild About Books, a New York Times #1 bestseller and winner of the E. B. White Read-Aloud Award. She is also the author of Thelonius Monster's Sky-High Fly Pie and The Secret Science Project that Almost Ate the School. She lives in Oakland, California.J. Otto Seibold, author/illustrator of Olive the Other Reindeer was one of the first children's book artists to create computer-generated art and is considered the master of that medium. He lives in San Francisco, California.